= 2 , where 0 is the rhombus angle and again k = ±1, ±2,----This solution is invariant under a rhombic rotation; that is, f(r, 6; 0) = f(r, 6 + n; 0) = Rf(r, 6; 0), where R is the rhombic rotation operator. Illustrative patterns are shown in Figure 2.10(c). and represent rolls with patterns as in Figure 2.10(d). These, of course, are simply the one-dimensional solutions (2.37). When the full nonlinear equations are solved numerically with initial conditions taken to be small random perturbations about the steady state, linear theory turns out to be a good predictor of the ultimate steady state in the one-dimensional situation, particularly if the unstable modes have large wavelengths, that is, small wavenumbers. With larger wavenumbers the predictions are less reliable—and even more so with two-dimensional structures. Since the equations we have studied are linear and invariant when multiplied by a constant, we can have equivalent solutions which are simply mirror images in the line u = u0; refer to Figure 2.8(b). Thus the pattern that evolves depends on the initial conditions and the final pattern tends to be the one closest to the initial conditions. There is, in a sense, a basin of attraction for the spatial patterns as regards the initial conditions. Once again near bifurcation situations singular perturbation analysis indicates nonlinear patterns closely related to the linear predictions. In general, however, away from the bifurcation boundaries linear predictions are much less reliable; see the computed patterns exhibited in the next chapter. Except for the simplest patterns, we should really use linear theory for two and three dimensions only as a guide to the wealth of patterns which can be generated by pattern formation mechanisms. Linear theory does, however, determine parameter ranges for pattern generation. Figure 2.10 shows a selection of regular patterns that can be formed by reaction diffusion equations based on linear theory. Mathematically (and experimentally of course) a key question is which of these will be formed from given initial conditions. If one pattern is formed, variation of which parameters will effect changing to another? To de termine which of the various possible patterns—hexagons, rhombi, squares or rolls— will be stable we have to go beyond linear theory and carry out a weakly nonlinear analysis; that is, the parameters are such that they are close to the bifurcation boundary from homogeneity to heterogeneity. When we do such a nonlinear analysis we can determine the conditions on the parameters for stability of these steady state spatially heterogeneous solutions. This has been done for reaction diffusion equations by Ermen-trout (1991) and Nagorcka and Mooney (1992) using a multi-scale singular perturbation analysis. Other pattern formation mechanisms, namely, cell-chemotaxis and mechanical mechanisms for pattern formation were studied by Zhu and Murray (1995). The latter compare chemotaxis systems and their patterning potential with reaction diffusion systems. Zhu and Murray (1995) were particularly interested in determining the parameter spaces which give rise to stable stripes, spots, squares and hexagons and their spatial characteristics such as wavelength and so on. In the case of spots they could also determine which of the tessalation spot arrangement patterns would be stable. They compared the robustness and sensitivity of different models and confirmed the results with extensive numerical simulations of the equations. The analytical technique is well established but the details are fairly complex. Zhu and Murray (1995) show from their numerical study of the equations how the transition takes place from stripes to spots and then to hexagonal patterns and the converse pathway how hexagons become unstable and eventually end up in stripes. The hexagons in effect become elongated and rhombic in character with the spots lining up in lines and eventually fusing; it makes intuitive sense. The analytical procedure near bifurcation is referred to as weakly nonlinear stability analysis, an extensive review of which is given by Wollkind et al. (1994). Generally the form of the interaction kinetics plays a major role in what patterns are obtained. 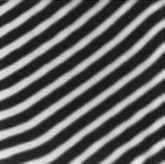 Cubic interactions tend to favour stripes while quadratic interactions tend to produce spots. When different boundary conditions (other than zero flux ones) are used the patterns obtained can be very different and less predictable. Barrio et al. (1999) investigated the effect of these and the role of the non-linearities in the patterns obtained. From extensive numerical simulations they sugggest that such reaction diffusion mechanisms could play a role in some of the complex patterns observed on fish. The patterns we have discussed up to now have mainly been regular in the sense that they are stripes, spots, hexagonal patterns and so on. Reaction diffusion systems can generate an enormous range of irregular patterns as we shall see in the following chapter where we discuss a few practical examples. The recent article by Meinhardt (2000: see also other references there) discusses complex patterns and in particular the application of reaction diffusion mechanisms to patterns of gene activation, a subject not treated in this book. He also reviews other important applications not treated here such as branching structures in plant morphology. In the analyses of the pattern formation potential of reaction diffusion systems here the reactants, or morphogens, must have different diffusion coefficients. In many developmental situations there are often preferred directions in which the diffusion of the same morphogen may have different values in different directions; that is, the diffusion is anisotropic. Although we do not discuss it here, this can have, as we would expect, a marked affect on the patterns formed in a Turing instability of the uniform state (see Exercise 10). It has been known for a long time, from the 1970's in fact, from many numerical studies that reaction diffusion systems can produce steady state finite amplitude spatial patterns. It is only in the last 10 years, however, that such steady state patterns, sometimes called Turing structures or Turing patterns, have been found experimentally. The experimental breakthrough started in 1989; see Ouyang et al. (1990,1993), Castets et al. (1990), Ouyang and Swinney (1991), Gunaratne et al. (1994), De Kepper et al. (1994) and other references in these articles. The last two are good reviews to get an overall picture of some of these developments. The latter also describe the complex structures which are obtained when the Turing structures interact with travelling waves; they can be highly complex with such phenomena as spatiotemporal intermittency and spot splitting to form more complex patterns and so on. Ouyang and Swinney (1991) experimentally demonstrate the transition from a uniform state to hexagonal and eventually striped patterns; the transition is similar to that found by Zhu and Murray (1995) for both reaction diffusion and cell-chemotaxis pattern formation mechanisms. Since these early experimental studies, Turing patterns have been found with several quite different reaction systems; the details of the chemistry and experimental arrangements are given in detail in the papers. 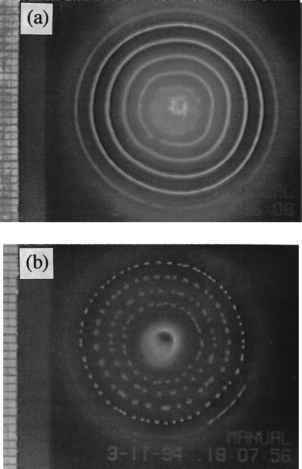 Figure 2.11 shows chemical Turing patterns obtained experimentally with a chlorite-iodide-malonic acid reaction diffusion system from Gunaratne et al. (1994). Note the small size of the domain and the accurately defined wavelength of the patterns which vary from 0.11 mm to 0.18 mm; these are certainly in the range we would expect of many morphogenetic situations and clearly demonstrate the potential for fine-scale delineation of pattern with reaction diffusion mechanisms and, from the theoretical studies of Zhu and Murray (1994) with other pattern generators. That they are of morphogenetic scale, in the case of the developing chick limb, at the time of the patterning associated with cartilage formation the width of the limb bud is of the order of 2 mm (see the discussion on a limb bud patterning scenario in Chapter 6). 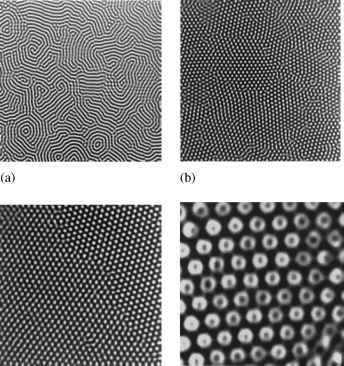 Wollkind and Stephenson (2000a,b) give a thorough and comprehensive discussion of the various transitions between patterns, including the black eye pattern shown in Figure 2.11. They specifically study the chlorite-iodide-malonic acid reaction system which was used in the experiments and importantly compare their results with experiment. They also relate these transitions between symmetry breaking structures in the chemical system to similar ones in quite different scientific contexts. The application of reaction diffusion pattern generation to specific developmental biology problems is often within the context of a prepattern theory whereby cells differentiate according to the level of the morphogen concentration in which they find themselves. If the spatial patterns is quite distinct, as described above or with relatively large gradients, less sensitive tuning is required of the cells in order to carry out their assigned roles than if the pattern variation or the concentration gradients are small. It is perhaps useful therefore to try to get a quantitative measure of spatial heterogeneity, which is meaningful biologically, so as to compare different mechanisms. Another biologically relevant method will be discussed in the next section.